The first ALH (Dhruv) Squadron was commissioned at Kochi today by Vice Admiral Shekhar Sinha, Flag Officer Commanding in Chief Western Naval Command. Dhruv is the first indigenously designed and manufactured helicopter at Hindustan Aeronautics Limited and with its multi role capabilities has proven her mettle in all the three services of the Armed Forces, Indian Coast Guard , BSF and in the inventory of foreign countries. The squadron would have the name Indian Naval Air Squadron (INAS) 322. Addressing the commissioning ceremony parade, Vice Admiral Sinha said that in the Navy, Dhruv helicopters has transformed into an advanced search and rescue (SAR) helicopter also used for missions like heliborne operations, and armed patrol with night vision devices. Such machines in the inventory have become imperative for the Navy given the scenario of low intensity maritime operations (LIMO) and coastal security construct said the Admiral. Looking ahead, Vice Admiral Sinha said that with the commissioning of Vikramaditya, Navy’s reach and ability to respond in real time to developing situations in our area of responsibility would see a quantum jump. Aerial assets like UAVs, Mig 29 K fighters, P 8 I and Dhruv have added punch. Vice Admiral Satish Soni, Flag Officer Commanding in Chief Southern Naval Command under whose administrative control INAS 322 would function, in his address said that, the versatile aircraft would soon be cleared for night SAR role, one of the few helicopters in the world to have that capability over sea. He also expressed satisfaction that the ALH would beef up the coast security architecture. Earlier, Smt Mona Sinha named the squadron as INAS 322 and unveiled the commissioning plaque. Commander Ravi Sivasankar, the first Commanding Officer of the Squadron recited the invocation and read out the commissioning warrant. The squadron will call themselves “Guardians” with the credo “Search Fearlessly, Rescue Valiantly” signifying their primary role of SAR. 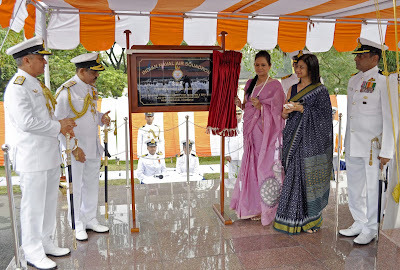 The commissioning ceremony was held at INS Garuda, the Naval Air Station and mother base of INAS 322.